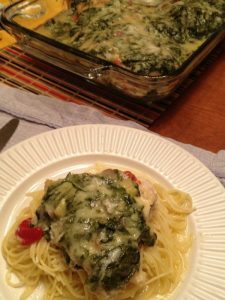 This post is about double duty dinner recipesideas is sponsored from Zaycon Foods. I was provided product to facilitate this review but no further compensation. All the opinions expressed are 100% my own. If you buy in bulk you really need to be able to freeze things properly as well have some good meal ideas. What a better way to meal plan than creating a double duty dinner where you cook your protein for two meals on one day. I recently picked up an order from Zaycon Foods. They sell in bulk like you never would imagine. 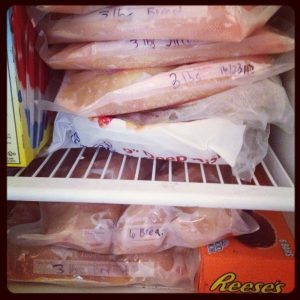 40 lbs of chicken is a lot of chicken but priced under $2 a lb it is worth finding a place to freeze it or splitting the purchase with a friend or two. Despite me going to the pick up site on the specified day to find no truck there, Zaycon took care of me and actually had the truck come the next day and deliver it to my door. I would not have been so disappointed but I had to drive 35 minutes each way I did not have another hour in my day to pick this up. The breasts were huge and after a little trimming I vacuum sealed over 9 bags at 3 lbs each. I knew I wanted to make a meal that I could use half of the chicken for another meal. I decided to make a Florentine chicken recipe I found in a Google search and make some extra chicken breasts, you know I had plenty, for a second meal later in the week, short cut chicken pot pie. Everyone really enjoyed this dinner and I simply baked a few extra chicken breasts to have for the second meal. It saved time and energy and the chicken breasts were available for the next meal. 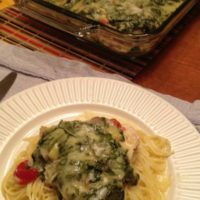 Make the Spinach topping. 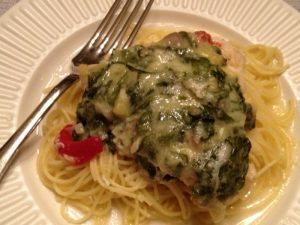 I used fresh spinach because I had some in the fridge I needed to use up. You can use frozen you just have to have it planned out and defrosted. This topping would be amazing over pasta or with cut up chicken mixed in with pasta. Soo tasty and relatively healthy too. The other breasts get some of the juices on them but that adds to the flavor. 2. In a small bowl combine cheese and seasoning. Roll chicken pieces in cheese mixture to coat lightly. Set remaining cheese mixture aside. 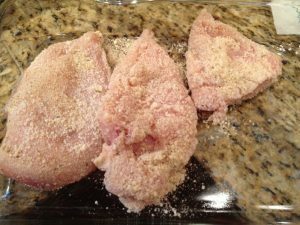 Arrange coated chicken pieces in an 8x8x2 inch baking dish. 3. In a small saucepan, saute green onion in butter/margarine until tender. Stir in flour, then add milk all at once. Simmer, stirring, until bubbly. 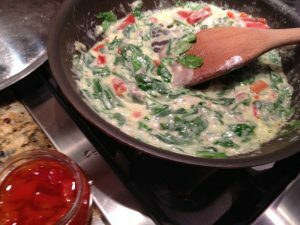 Stir in drained or cooked fresh spinach and pimiento and mix together. 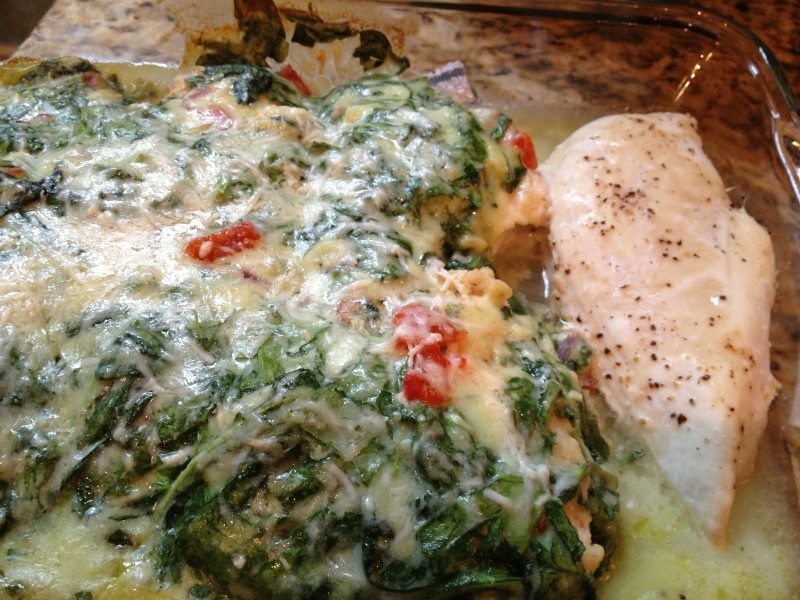 Spoon spinach mixture over chicken and sprinkle with remaining cheese mixture. Bake uncovered for 30 to 35 minutes or until tender and chicken juices run clear. simply bake 2 more seasoned chicken breasts for a second meal. I love this recipe. This may be my protein recipe for the week! This looks so delicious! I wonder if the kids would eat it? That looks fantastic, and what a good way to get some extra veggies in!